The Summer Village Hotel is a luxury family-friendly hotel in Marmari, Kos in Greece. The closest beach is just 600m away from the hotel complex. The property houses 2 beautiful outdoor swimming pools on its premises. The architecture and interiors of the resort are minimalist and inspired by Greek motifs. The property houses 78 tastefully designed guestrooms in bungalow style, which are equipped with amenities to make the guests’ stay a luxurious experience. 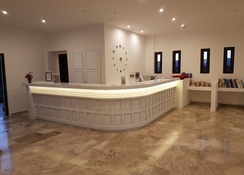 The hotel is located 1.2km away from the town of Marmari, giving the guests a great opportunity to experience the life in Kos as well as Greece. This is a great destination for couples and families looking for a beach vacation in Greece. The Sumer Village Hotel is located 12.5km away from the Kos International Airport. The nearest beach is 600m away from the property. The town of Marmari is at a walkable distance of 1.2km from the hotel and 13.4km away from the town centre of Kos. The hotel is closely located to a mini supermarket, a mini golf course and bike rentals. The property is nestled in a quiet and peaceful location. The Summer Village Hotel has 78 tastefully decorated guest rooms in bungalow style which have been designed with utmost elegance. The décor is minimalist and inspired by Greek architecture. All the guestrooms are spacious and come with an attached balcony and/or terrace, giving the guests a sense of a sunny beach holiday. Air Conditioning eco-friendly luxury mattress, heaters, marble flooring, bathroom, toilet, flat-screen TV with satellite channels, refrigerator, telephone, etc. are some of the features and facilities available at the room. The Summer Village Hotel houses a restaurant, snack bar and bar that serve a wide range of international and local Greek Mediterranean cuisines. The meals are served in buffet. Apart from that, the bar also serves a variety of local wines, beers, signature cocktails, alcoholic and non-alcoholic beverages. The guests can also try local restaurants, traditional taverns and bars in towns of Kos and Marmari. The Summer Village Hotel houses 2 beautiful, large outdoor swimming pools, for both adults and children, which serves as an excellent option for recreational opportunities like pool games or refreshing dips. The guests can indulge in activities like mini golf, hiking, table tennis, billiards, darts, beach volleyball, bingo, etc. while at the hotel. The guests can also try water sports at the beach nearby. The beach is also an excellent spot for the guests to relax and spend some quality time sunbathing. A simple place - ideal for relaxing, we went for a long weekend. Very pleasant staff and basic facilities in a quiet area. We used the bicycle hire opposite, it was the best way of exploring for us. We caught the bus locally into Kos town. Friendly staff, fantastic pool and good food. For a budget friendly holiday then its perfect and wouldnt hesitate to using again if visiting Kos.